As a consequence, many apps can't be run twice in a row anymore. And many apps can't be run anymore if the last run app used some grob objects with the same dimensions. 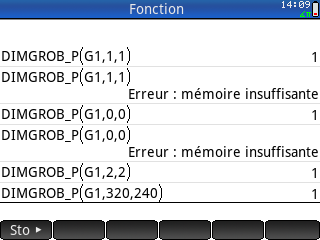 The user will need to manually DIMGROB_P to some random values between apps if he knows about the issue, or to reset. The problem wasn't there in 13217 beta. Any workaround ? Is there a way to check the grob dimensions before calling DIMGROB_P ? Oh, thank you for such a prompt and valuable reply. I'll try. Ok, the new versions are out and posted. This will correct that issue. Wow, you're faster than light.